I had written to Margret for years, but never met her till now, or little Charles, 2 years. Marg was so nice and made us so welcome; she is still a dear and we all love her, 23 years after. After a peek at Charles we all went to bed. We had reached Calgary in one piece. I remember seeing my cousin, Charles, that first night. Next day, both Ron and Ed were off to work, so Marg and I and the children got acquainted. Charles was so fair of hair and ours were so dark. They got along fine, Bob and Charles age 2 and Linda age 4. The change of altitude affected us all, in tiredness, and Bob was the hardest to settle down. 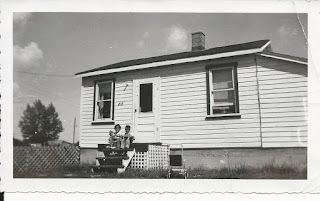 During the two weeks we stayed at Ed and Marg's I went out to Bowness to clean up the little three roomed house we were lucky enough to rent due to a severe housing shortage. It was an awful place, and as there was no sewer or water service in the town at that time, we had a well and a chemical toilet, and all used water had to be carried out. What a job and hard work. The well wasn't covered, and to keep the kids from falling in, Ron built a house over it, so it was safe. Ron preparing to lower a liner into our well, 1955. He had built the pump house the year before, designed with a lid he could raise so the liner could be added easily. In the background is the home of our neighbors, the Kerrys. There was a decent basement and the kids played there a lot in winter, even if it was cold. When I washed the clothes and hung them in the basement they would freeze solid. Just shows how cold it was. We had a big yard and Ron put up a fence so the two little ones couldn't get into the road. We had lots of room for them in the back, and over the years we seeded most of it to grass and planted trees. 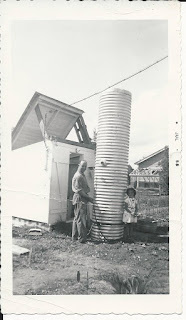 After that first winter, Ron piped water into the house, and we only used the well for the garden. Ron dug a ditch, two feet deep to be below the frost line, from the well to the house. He added a pump, and suddenly we had a single cold water tap, in the basement. Despite the inconvenience, it was a huge improvement on the first years when Ron had to use an old-fashioned handle pump at the well, for all our water. In the winter, he took a kettle of boiling water outside to prime the pump, before we could get any water. A few years later, he extended the water pipe from the basement to the kitchen. Letty was ecstatic. We still had a chemical toilet, and had to haul out all waste water, however, until Bowness joined the City of Calgary. We rented this place for two years, then bought it for $4000, paid as rent. It took us seven years to pay it off, but in that time Ron and I remade the house and put in a good furnace and a bathroom, and a few thousand dollars soon were spent. In August 1964, Calgary took over Bowness as part of the city, and about the first thing they did was put in the sewer system and hook us up to Calgary. This was very welcome, as there were hundreds upon hundreds of out-houses and it wasn't very good. 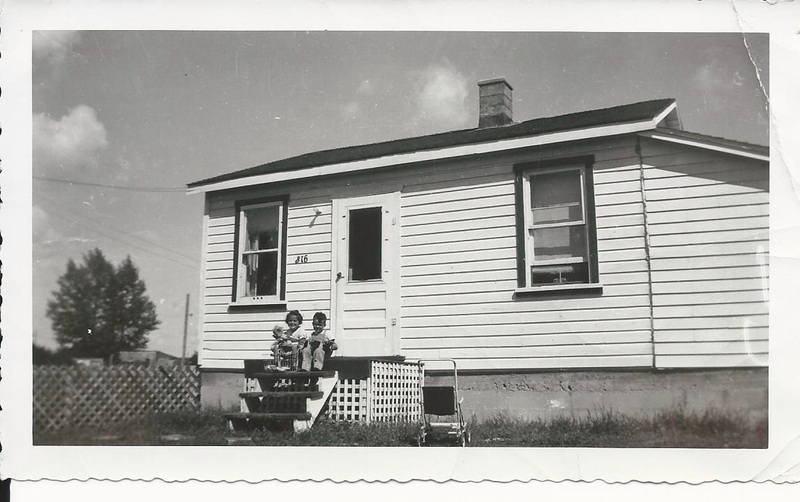 Calgary was bursting at the seams and houses were at a real premium, or else we wouldn't have taken this tiny house. However, with a little ingenuity and love it was a real home. It's not the house that counts, its the people in it. But the hard work that was required just about proved fatal to Ron years later. Poor Ron, his first year here was hard on him, and had we the cash we would have returned to England at the earliest date. My heart ached for him. Linda didn't help much, poor little girl was homesick and cried every day for two months to go back. Bob was too young to are, and was sick, so I had my hands full. Then a lady who lived behind us said there was a kindergarten near, and after enrolling Linda for three days a week, she didn't cry anymore. We are still friends with Betty Miller, and I'm still grateful to her for that period in life, when she solved one problem for the Evanses. Linda went to Mrs. Miller's for one year and when she started school went into Grade 2 because she could read so well. Mrs. Gray was her teacher. Dear Mindy, this is the last page in Book 1, so I will have to start on Book 2. I hope you have enjoyed reading this, love. Dear Blog Readers: I began this blog with some of Letty's later writings, called "My View." Tomorrow, I will return to that series.